Today, I have visited pages of YouTube. I have found, how great YouTube is. If you have a little bit o free time and access to the internet; visit youtube.com and be sure that your free time disappear in a minute. During my spent time on YouTube I have succeeded in finding some nice videos about Prague. If you have never been in Prague, I think, it is one of the best ways to introduce you Prague as a city. Only what you need is a few minutes to play these videos. And if you have been in Prague, so this is a great opportunity to get your memories back. Except one video, all of them are from independent authors, therefore be sure that you will get independent insights. I was trying to find the best videos of Prague on YouTube. Moreover on our Facebook profile you can find a poll, where you can vote for the best Prague videos. In addition you don’t have to have Facebook profile to access our pages. First video is from author called railaybay. This great video could served as tourist guide video for Prague. The author is travelling around the world. On his journeys around the world he finds himself in one of Europe most historical city. His real name is Michael Murphy and he will be introducing this Destination Unknown Prague, Czech republic. The second video is similar to fist one. However it is called Prague In Your Pocket. The author, Jacy Meyer takes us on a tour of the main tourist sites in Prague including Venceslas Square, the Powder Tower, the Royal Route, Old Town Square, the Astronomical Clock, Prague Castle, Petrin Hill and Petrin Tower. Next video is without any guide. It is a batch of great pictures from Prague. It is backgrounded by Czech famous lady singer (H. Vondráčková). 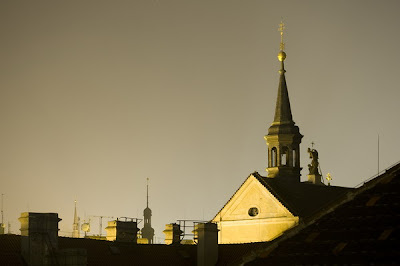 In this video you will find, how Prague look like in the evening. I don’t know, how much you like evening walking, but I love it. Everything is changing with coming of night. The monuments are getting new faces and Prague pubs are inviting you for glass of beer or wine. This is my favourite video, it is quite new on Youtube but it is really well made. These guys knew, what they were doing, they had lucky hand in selecting the best pictures and choosing the right music for this video. Enjoy. A last contribution is our video. It is one year old; however we were trying to do our best. The first part is introducing Prague and the second part is more focused on introducing Prague City Apartments. 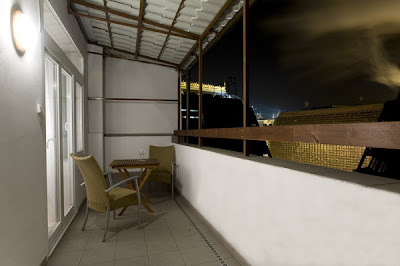 For having the best experience from Prague, you need best quality accommodation. In general, Prague is safer than most large cities in Europe. On one hand on the pages of U.S. Department of State you can find information about avoiding strikes, but on the other hand the strikes are occurring very rarely. The Czech Republic generally has a low crime rate. However, street crime – particularly pick-pocketing and occasional mugging –is a problem, especially in major tourist areas in Prague. From the lines above that the biggest problem of Prague security is concerning pickpocketing. On the picture below you can see the most risky spots in Prague (source: tn.cz). •Don't change money on the streets. It's dangerous, it's illegal and it's more than likely counterfeit money. • Using taxis, always agree on a price before getting in the cab. Normal fare within the city is 100-200 crowns--500-600 to the airport. Never accept "It's according to the meter." Establish a price. We are happy to call a reliable cab for you, or arrange our private very nice cars who work for us and are serious. Never ask a cab to take you to a 'gentleman's club,' as they often get at least 1,000 crown commission per one person. • Very friendly girl or women with multiple children, who approach you on the streets are pick-pockets, protected by 'minders." Be very careful. Don't let them 'swarm' you with kids or into an alley. They are experts and are very dangerous. • Some con artists pose as "Currency Inspectors." They will flash 'ID cards' and ask to inspect your money. NEVER DO THIS. There is NO SUCH PERSON as a currency inspector. If he persists, call for police--he will disappear immediately. However we did not find anything suspicion. Finally we found that during they absence in the apartments they left open window. To be more clear they were staying on the first floor and there was small construction site behing the building. Unfortunately they have lost some of the valuables. Furthermore we are offering security sefes for protecting your values. Finally it can be stated that Prague is safe place. On one hand Prague is suffering of pick-pocketing; however no more than the other european cities. On the other hand Prague is clean and safe place for spending your holiday without any fear. 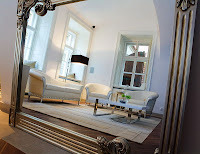 Prague accommodations are offering severel posibilities of protecting your private. Like example I have used my own experience and I have demostrate our security apartments systems. Today, we have prepared a small Prague beer guide. The Czech Republic is very famous because of Prague and its spots; classical musicians, such as Dvorak or Smetana and because of beer. But first a little bit of history. According server praha.eu we have picked two most famous beer pubs in Prague. The first one was already mentioned, U Fleku. It is not really necessary to introduce the “U Fleků” brewery and restaurant. 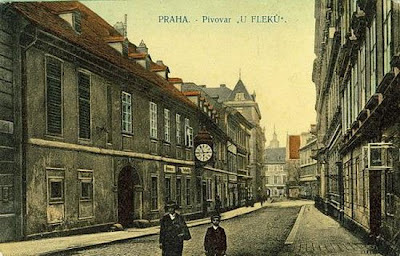 Perhaps everybody who has walked down the Křemencová street has kept in mind a richly decorated clock on the brewery’s facade that asks everybody to visit any of the several rooms of the restaurant. And everybody who has come in has kept in mind, or better on the tongue, a delicious and unique taste of “U Fleků” 13° lager. Up to now the lager has been brewed according to old recipes, but in a newly furnished setting with the same care as in the time of our great grandfathers. The “U Fleků” brewery celebrated its 500th anniversary since it was founded in 1499. The restaurant takes pride in its own brewery, especially the historic brewing house from the beginning of the century, the stacked cooling vats and the fermentors in the fermentation cellar made, according to old specifications, of oak wood. The brewery received its present look during the 1986 reconstruction that resulted in a modern, but unique historic brewery. ut. Yes, a beautiful, rambling pub, very simply furnished in plain wood, but with only transient tourists frequenting it, muchof its unique character has been lost. As if to finally prove that 's it's no longer for Czechs, the beer is sneakily served in 0.4 l glasses (a fact that they don't advertise too much). Oh, and the waiters will try and push unrequested, expensive spirits on you. Whoever wants to get to know the originality of the Bohemian kitchen and to taste the well-tempered beer has to find their way here. The whole thing is here, on the grounds of "The Goblet", where "The Good Soldier Švejk" (Strašlipka) found their beginning. When you think of Prague, you probably think of wonderful scenery. And there’s a lot of that to be found and enjoyed here. Use Google images search to get better idea of Prague pictures. Travelers who have visited Prague can just agree that Prague is a great place for taking pictures/photos. Therefore, I have picked up a few pictures which have been taken from the windows or balconies of our residences. First picture is from Residence Karlova - view from apartment No.42. In the background you can see the biggest castle complex in the world, called Hradcany. Moreover, you can notice why Prague is sometimes called "one hundred towers" Prague. Next three pictures have been taken from our National Theatre Apartments. The second picture - night scenery from apartment No. 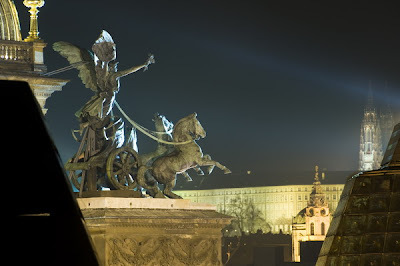 52 - shows how wonderful Prague looks like at night when the monuments are beautifully lighted. The third picture has been taken from apartment No. 52. Again, you can see Hradcany in the background. In the front there is a statue of angel with a team which is situated on the roof of National theatre. Last picture from National theatre apartments has been taken from the same balcony of our Prague apartment - summer terrace no. 52. Actually it is zoomed out of last the picture above. The major building is part of National theatre, however, it is a new part, called Laterna Magica. Last picture belongs to Residence Karolina. The picture has been taken inside of our Prague apartment. In the window you can see, again, Hradcany, which is one of the famous tourist destinations in Prague. Please note that the author of pictures is the owner of Prague City Apartments. His hobby is photograpy. Additionally more picture you can find on our Flickr profile. Hope you have enjoyed our views. 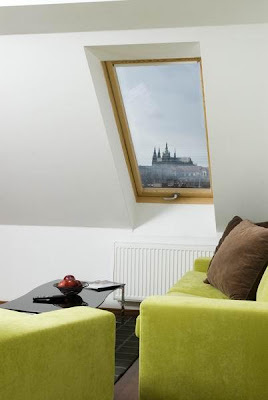 Welcome to our Prague City Apartments blog! Welcome to the brand new Prague City Apartments blog! My name is Karel. If you’ve visited our apartments it’s possible we may have met in person. It’s nice to “see” you again. If we haven’t met, I’m hoping your being here means we’ll see you soon! We decided to start the blog because there are always so many things happening in Prague, and in the residences, that we thought this would be a great way to share it all in one place. Whether you’re in town for business or for fun it’s nice to arrive knowing what’s going on. A few times a week, we’ll check in with stuff about Prague events. Moreover we’ll share news from our residences, news from Prague, heading of Prague City Apartments and much more. Part of the reason I love working as Marketing executive is I get to interact every day with our guests. I’m really excited about the blog because it gives me a whole new way of doing that. I hope you enjoy it, too. So check back often. We’ll be here.